The Universal Film Manufacturing Company, Incorporated, production; distributed by Jewel Productions, Incorporated (The Universal Film Manufacturing Company, Incorporated) [Universal-Jewel Master Production]. / Scenario by Erich von Stroheim, from the screen story “Clothes and Treachery” by Baroness de Meyer (Erich von Stroheim). Production design by Erich von Stroheim. Assistant director, Edward Sowders (Eddy Sowders) + [Jack Proctor and Jeanne Spencer]. Cinematography by Ben F. Reynolds, with additional photography by Howard Oswald and William Daniels. Art titles by J.H. Buffum. Edited by Jean Spencer (Jeanne Spencer). Presented by Carl Laemmle. / © 3 September 1920 by The Universal Film Manufacturing Company, Incorporated [LP15513]. Premiered 8 August 1920 at the Capitol Theatre in New York, New York, and in Chicago, Illinois. Released 30 August 1920. / Standard 35mm spherical 1.33:1 format. / Working titles: Clothes and Treachery and The Woman in the Plot. 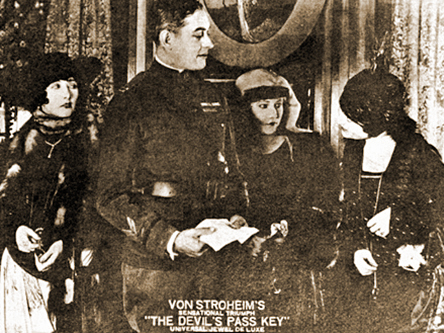 The production was shot from September 1919 through December 1919. In 1941, it was discovered that the original nitrate negative had decomposed in the Universal film vaults. [?] A story in the Hollywood Reporter, international edition, dated 12 November 1993, stated that this film would be shown at the 1994 Berlin Film Festival — a film previously thought to be lost; the validity of this has not yet been proven. Synopsis: Synopses available in AFI-F1 n. F1.1026, Hirschhorn-Universal p. 34, and in Weinberg-Stroheim p. 22, 24. Listing updated: 18 May 2012. References: AFI-F1 n. F1.1026; Bohn-Light p. 86; Card-Seductive p. 45; Edmonds-BigU pp. 105, 106; Everson-American pp. 286, 328; Fell-History pp. 114, 116; Hirschhorn-Universal pp. 14, 34; Sarris-Sternberg p. 6; Vermilye-Twenties p. 74; Weinberg-Stroheim pp. xi, xii, 21-31.